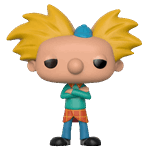 Young Arnold lives with his grandparents in the city of Hillwood. The fourth grader with a football-shaped head takes on adventures to help solve classmates' problems or come up with solutions to his own predicaments. This Pop! shows football head himself, Arnold.